A relatively small number of babies - compared to the overall number of births, need help turning into the vertex (head down, facing back) position. I've had good success with this using relaxation and specific Hypnotic techniques. I suggest that you also utilize acupuncture,and the Webster technique used by Chiropractors first and then possibly ECV (external cephalic version)done by a medical doctor. The mothers using this hypnotic technique receive a cd so they can continue this work at home. Mom often has built up fears around the procedures and outcomes and I would deal with those at that time as well, leaving Mom calm and relaxed, with the baby turned or in the best possible situation to turn. If the baby is not going to turn or a breech vaginal birth is not possible then I can work on any fears or disappointments surrounding a c-section with an emphasis on a quick, healthy recovery time with lots of energy, lots of milk (if breastfeeding) and great bonding. Also, suggestions can be given to make the c-section be as close to natural birth as possible. This concept is supported in a study presented in May, 1992 by Dr. Lewis Mehl-Madrona formerly of the Psychiatric Department, University of Vermont Medical School. The study included 100 women who were referred from practicing obstetricians and an additional 100 who responded to an advertisement. 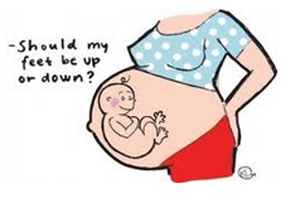 Only women carrying their babies in breech position at 36 weeks gestation or more were included. Dr. Mehl-Madrona used hypnotherapy with the 100 women in the study group. The comparison group of 100 women had no hypnotherapy, though some did have ECV (external cephalic version), a procedure whereby the baby’s head is manually manipulated from outside the abdomen to bring about the downward turn. In the study group the Mothers, while in hypnosis, were led through guided imagery to bring about deep relaxation. Suggestions were then given that they visualize their babies easily turning and see the turn accomplished, with the baby in proper vertex position for birthing. The Mothers were helped to visualize the uterus becoming pliable and relaxed in order to allow the baby sufficient room to make the move. The Mother was asked to talk to her baby, and the therapist encouraged the baby to release itself from the position it had settled into and to turn downward for an easy birth. The study ended with 81 of the 100 breech babies having turned spontaneously from breech to vertex presentation. In the comparison group of 100 women who did not participate in hypnotherapy, only 26 babies turned spontaneously. An additional twenty turned with ECV. It is not uncommon for the baby who is turned through ECV to turn back into breech position. It was originally thought that each Mother would require approximately ten hours of hypnotherapy in order to accomplish the desired result. As the study unfolded, the average number of hours with each woman was only four, and half of the successful 81 turns required only one session.